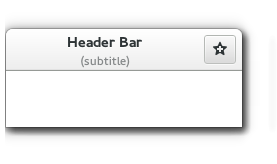 GtkHeaderBar is similar to a horizontal Box. It allows children to be placed at the start or the end. In addition, it allows a title and subtitle to be displayed. The title will be centered with respect to the width of the box, even if the children at either side take up different amounts of space. The height of the titlebar will be set to provide sufficient space for the subtitle, even if none is currently set. If a subtitle is not needed, the space reservation can be turned off with set_has_subtitle. GtkHeaderBar can add typical window frame controls, such as minimize, maximize and close buttons, or the window icon. For these reasons, GtkHeaderBar is the natural choice for use as the custom titlebar widget of a Window (see set_titlebar ), as it gives features typical of titlebars while allowing the addition of child widgets. The decoration layout for buttons. Set to true if decoration_layout is set. Creates a new HeaderBar widget. Retrieves the custom title widget of the header. Gets the decoration layout set with set_decoration_layout. Retrieves the subtitle of the header. Retrieves the title of the header. Adds child to this, packed with reference to the end of the this. Adds child to this, packed with reference to the start of the this. Sets a custom title for the HeaderBar. Sets the decoration layout for this header bar, overriding the gtk_decoration_layout setting. Sets the subtitle of the HeaderBar. Sets the title of the HeaderBar.